Rogers has had many prominent and outstanding citizens in all walks of life in its history, but one of the most colorful and adventurous was C. Jimmie Carter. 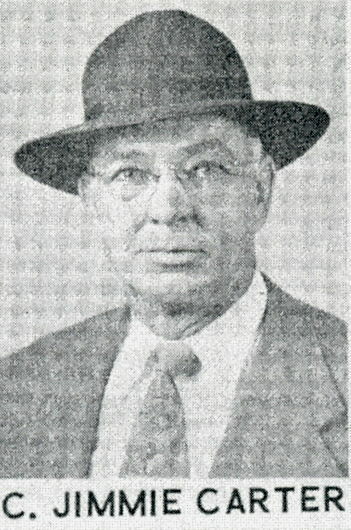 Carter came to Rogers in 1933 from Kansas City. According to an article in the Poultry and Eggs Weekly, August 2, 1958, Carter during his lifetime was a farmer, bronc buster, prize fighter, wrestler, magician, radio announcer, Judo instructor, timber cutter, ox team driver, night club bouncer, taxi driver, air show promoter, pilot, special policeman, public relations specialist, and owner of several businesses. While living in Kansas City, Carter is credited with selling the first electrically powered radios in the area. He got into the poultry medicine business in 1924 with his supplies in his car and his office in his hat. The depression hit and in 1933, Carter and his wife, Joan, lived in one room with only $20 to their name. They headed for NW Arkansas where they were told they would starve to death. “You’ll starve anywhere,” he said. In Rogers, he rented a home for $25 a month and hit the streets selling his poultry medicine. The first day, he sold three people 65 cents worth each, and told his wife, “We’ve got it made.” In 1935, his annual income was a whopping $879 and the next year it was $4,436. “That was big money. There wasn’t anybody in that class at that time.” (Benton County Daily Democrat, 11-26-1985) Carter continued to expand his poultry medication business and became a prominent local businessman in the poultry industry. 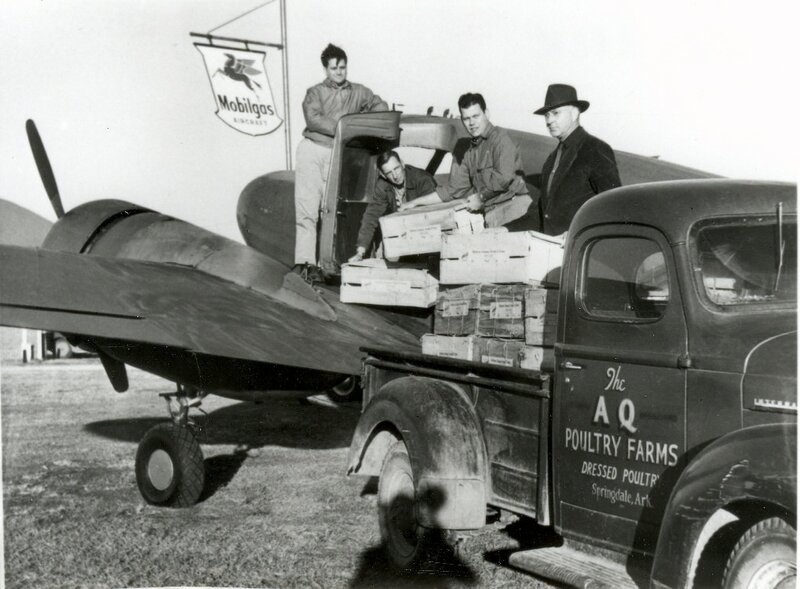 By the late 1930s, the farm economy of NW Arkansas had switched from apples to poultry. In 1937-38, Northwest Arkansas produced over 10 million broiler chickens and Benton County became the national leader in broiler production. Local hatcheries could not produce enough baby chicks, so they had to be imported from other areas. In 1939, Carter imported the first major shipment of chicks into NW Arkansas. That one shipment came into Rogers by train and consisted of 40,000 chicks. C. Jimmie Carter borrowed some heavy equipment from the county and graded a suitable airstrip. The runways were extended and lighted and facilities for the storage and sale of airplane fuel were built. Rogers had the first lighted field in the area and in December, 1947, the first night flights in NW Arkanasas were made in separate planes by C. Jimmie Carter and Buddy McGregor. In the next four years, 12 million baby chicks were flown into the Rogers airport. From 1948 until 1952, the Rogers Airport was the largest receiving point for baby chicks in the world. Chicks came into the airport in any type of plane that could carry 2000 or more chicks. Many times two or more C-47s and several small planes would be unloading chicks at the same time. Every square inch of the plane would be crammed with boxes of chicks, and it was not unusual for chick boxes to have to be unloaded before the pilot could get out of the cockpit. Even with all of these accomplishments, the memory that first comes to mind when the name, C. Jimmy Carter, is mentioned is the great car skate on Lake Atalanta on January 21, 1940. The day was cloudy and cold, the high temperature for the day was 21 and the low registered 2 degrees above zero. It was a typical setting for a fine day of ice skating on Lake Atalanta ... except for a prominent citizen, two of his buddies and a Buick automobile. That was the day that C. Jimmie Carter, known then as C(razy) Jimmie decided that it would be a nice drive to enjoy by heading out onto the ice at the lake. The following is an account from January 21, 1940 by the late Everett Pate, publisher of the Rogers Daily News: “... If he had been smart enough to quit, he might have had his name in the book sometime. But it was so much fun gunnin’ ‘er and then slapping on brakes and going into a spin … that he just couldn’t find a quitting place. 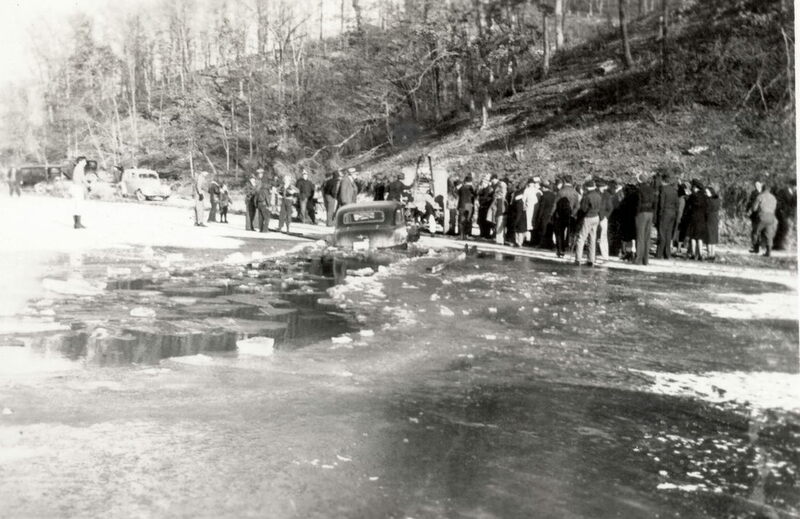 Finally something happened – no one seems to know just what – and C(razy) Jimmie and his two pals, Ray Rogers and Buddy Whitlow, and a nice Buick sedan crashed through the ice of Lake Atalanta. It was great fun for the hundreds who gathered along the lake shore Sunday afternoon to watch the work of recovering the automobile from the icy water ...” Many years later, when Carter was an old man, he related that after the automobile ice adventure, not a day passed in his life when someone didn’t mention it. Tom Hughes contributed another of C. Jimmie Carter’s adventures: “It occurred in about 1949. I was living in Eureka Springs at that time. A carnival set up at the edge of Eureka… Shortly after they opened for operation it became clear that it was going to be trouble. Several people felt that they had been cheated at the games but, as best I can recall, things really got hot when some teenager complained and he got roughed up in the process. There was a lot of milling around and muttered threats by the citizens… I happened to be riding to Rogers the next day and observed the same carnival setting up at the north edge of town. I stopped at a gas station downtown and warned them to be on the lookout. C. Jimmie Carter lived from July 23, 1905 until February 12, 1987. One of his most famous quotes was, “I find living one of the most interesting things in the world.” He was an important contributor to the formation of Rogers and his exploits and adventures will be remembered for generations. Free Book for a limited time to the first 25 new members who join the Friends in 2016. In addition to the regular benefits and gifts for new members, now you can get a free copy of The Lost Town of Monte Ne by James Hales. This book sells for $11.99 and is the story of the fabulous resort town beneath the waters of Beaver Lake, and a guide to the historic sites that can be seen today. This popular book is in its second printing with hundreds of historic pictures. Click Here to join. ​Note: You must pick up your free copy at the Rogers Historical Museum, 322 S. Second Street, Rogers, AR. Just join the Friends online or at the Museum and come by to pick up your free book. Enjoy your Stories and Memories of Rogers, Arkansas. Thank you for your support of preserving our priceless heritage.